Janet Duvendeck with Randels students holding flowers and framed certificate of appreciation presented at day in her honor. FLINT TWP. — Janet Duvendeck, a first grade teacher at Randels Elementary, was one of 1,000 teachers nationwide surprised in their classrooms Oct. 2 as winners of OfficeMax’s A Day Made Better. Now in its sixth year, the program’s stated mission is to relieve the financial burden on teachers who buy classroom supplies with their own money. In a press release, OfficeMax quoted a recent survey which found that more than 90 percent of teachers spend about $1,000 each year on basic school supplies for their students. Through an in-store supply drive this summer to support A Day Made Better, OfficeMax locations nationwide collected nearly $900,000 from customers and business clients. Then on Oct. 2, OfficeMax teams delivered $1.9 million worth of supplies to honored teachers like Duvendeck. 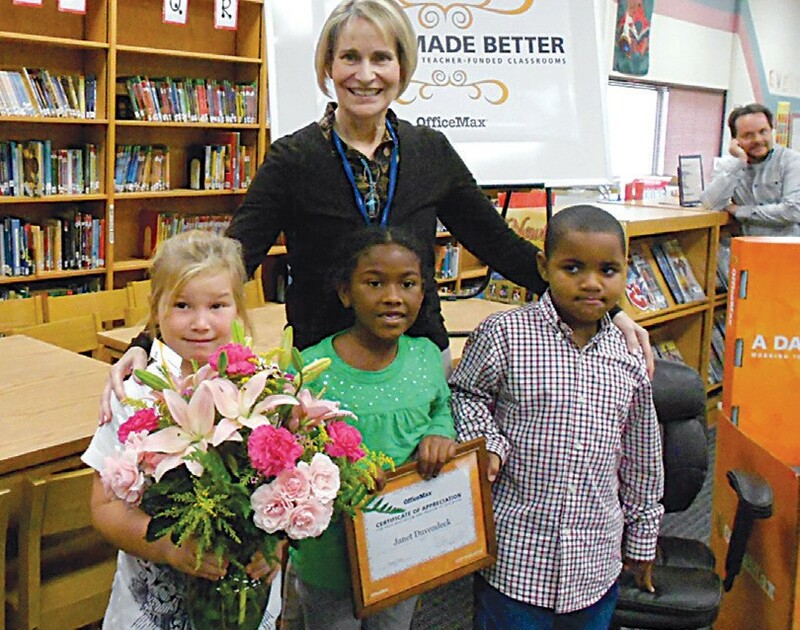 Duvendeck was a first grade teacher at the former Woodland Elementary School when she was nominated for the honor last year by her principal, Maria Cox. In her nominating letter, Cox described Duvendeck as an exemplary teacher. Cox also praised Duvendeck for her tremendous contributions to the teaching profession including regularly supervising student teachers, contributing her knowledge and expertise to her Professional Learning Community team members and volunteering for school and district-wide committees such as School Improvement. Duvendeck received about $5,300 worth of school supplies and an additional $1,000 in personal products including an office chair, videocamera, laminator and labelmaker, according to Dave Swierpel, Carman Ainsworth director of communication, in a report at the school board meeting Tuesday night. Superintendent Steve Tunnicliff added that Duvendeck was the only teacher in Genesee County chosen for the honor. About 44 teachers statewide also were recognized. Duvendeck said the teacher’s chair is one of her favorite items. It is comfortable, easy to adjust and will be used daily when students come to read with her, she said. Duvendeck will use the videocamera to make videos of classroom activities and the laminator will be in high demand for many projects, she said. Each of her students also were allowed to choose an item from the gift pile and most chose sanitary wipes for the table. One little girl also asked if she could also take some writing paper because she didn’t have any at home. Duvendeck has also shared her winning with fellow teachers with the rest going into the supply room for future use by everyone. School supply lists typically go way beyond pencil and paper. Ziploc sandwich bags, dry erase markers, bandaids, a box of tissues, glue sticks and disinfecting wipes are among supplies needed by first graders at Randels. Since 2007, A Day Made Better and other OfficeMax Goodworks programs have contributed more than $18 million in grants and supplies to support more than 29,000 teachers and their classrooms. Additionally, through the annual event, OfficeMax has helped its nonprofit partner AdoptAClassroom.org secure funding for more than 78,000 classrooms nationwide. In a new program this year, throughout October, OfficeMax stores are accepting monetary donations at the checkout counters to benefit AdoptAClassroom.org. These donations will be put into a spending account on AdoptAClassroom.org, where schools that participate in A Day Made Better can use the donations to order additional supplies and equipment for their classrooms.